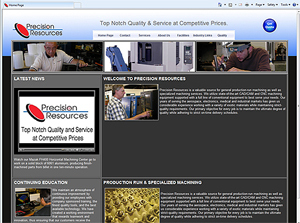 We just put the finishing touches on the new www.PrecisionResources.com website. Check out our Services, Facilities, equipment and capabilities. Come meet the staff at Precision, look at our machinery, read case studies or find helpful tools in our Industry Links section. Particularly timely discussion considering Chinese president Hu Jintao’s recent visit and President Obama’s state of the Union speech where he called for a new “Sputnik moment” in reference to the space race of the 1960’s. What should be done? Do we “double down” on the economic stimulus or try lowering taxes? How do we spur companies to invest in research and development? And what about our looming trade deficit with the Chinese and the huge amount of U.S. debt they hold? The key to unlocking these puzzles is the Creation of Fundamental Wealth. Fundamental wealth, that wealth from which all other wealth flows, can only be created in one manner; By digging something out of the ground (or cutting it down from the forest) and transforming it into something else by adding value through labor. Consider this; for thousands of years mankind lived in a largely agrarian society where each person grew his own food. Most trade was barter, and it was very difficult to move around. Abject poverty was the norm, and if someone was richer than you it was usually because he owned more land (or better land) than you did. It was only in the last 200 years or so that this began to change, as some very important inventions were created and the industrial revolution was launched. In the manufacturing field, many of these inventors were Americans. Eli Whitney, who invented the cotton gin, also was largely responsible for inventing the first practical milling machine in 1818. The very prolific team of Brown and Sharpe took that invention and refined it into the first commercially available mill. Brown and Sharpe was also responsible for many other items still used today in the machine shop, including the Micrometer, the Vernier Caliper, the Cylindrical Grinding machine and the Gear cutting and dividing head. Brown and Sharpe’s introduction of the cam-operated automatic screw machine in the 1870’s literally revolutionized the way turned parts were made. James Watt’s 1848 refinement of the steam engine made it possible for small machine shops to sprout up all over the country. Americans continued to define manufacturing through the decades, and still do. Many of these inventions, though important, remain obscure. Ever heard of John Parsons? Parsons was responsible for one of the most important, if unheralded manufacturing innovations of the 20th century. His work developing reliable servo control, the APT (Automatic programmed tool) language and his 1958 patent Motor-controlled apparatus for positioning machine tool laid the groundwork for the modern CNC machine tools we know today. The resulting labor savings and corresponding increase in the standard of living throughout the world that sprung from the work of these great Americans simply cannot be understated. American manufacturing was considered the best and most efficient and the American worker the most productive in the world throughout most of the 20th century, and Americans had (and still enjoy) the greatest standard of living. But sometime in the 1970’s this began to change. I still remember as a child in the 1960’s that Japanese products were considered cheap and inferior. Little did we know that the Japanese were embracing and creating a vision of manufacturing and quality that would make them the envy of the entire world. More on that in a future article, but we all know what happened. Today, China is on the brink of becoming what Japan did in the 1970’s. The Chinese have figured out that if you can build and ship a product to the USA cheaper than you can manufacture it here, buyers will take advantage of that. The Chinese have bought up the assets of American steel and aluminum mills as poor management has caused them to close their doors. They have built the infrastructure and encouraged investment. Entire regions of the country have been designated manufacturing zones, with individual cities specializing in one product or a group of products. They have made it clear that they are to be taken seriously. The American consumer has benefited greatly from this trend. I still remember my family’s first color TV, bought in 1964 or so. It had a 19” screen, no remote and cost $500. Today, you can buy a 32” flat screen LCD TV for that price. It’s high definition, and probably has a built-in DVD player. $500 in 1964 money is worth about $3500.00 today. And I don’t think they make TV’s without remote controls anymore. Rather than espouse a protectionist philosophy, I say more power to em’. If they want to hold the value of their currency down, let them. American consumers are reaping the rewards along with the Chinese workers, as their standard of living increases. The creation of fundamental wealth has brought enormous benefits to citizens all over the world. Americans will continue to be the inventors, the creators, the innovators, The question is, will the US Federal and State governments continue to foster the kind of environment that encourages manufacturers to make their products here? Time will tell. Our latest acquisition is this Puma 240B. Fast and efficient yet robust and powerful, this machine filled the bill for our varied job shop environment. With a maximum turning diameter of almost 12", bar-working diameter of 2.600" and maximum turning length of over 22", the Puma gives us new capabilities to serve our customers with. The machine features solid boxway construction for rigidity and a 20HP spindle motor producing 188 foot-lbs of torque. Also included in the package are a turning tool pre-setter, built in barfeed interface, and a high-pressure coolant pump for improved tool life. The machine has performed its first few jobs flawlessly. In this edition we will be highlighting the capabilities of our CNC lathe and grinding departments, as well as talents of our manufacturing planners and the strength of our approved supplier partnerships. This item is a highly stressed military aircraft landing gear part. As such, considerable care must be exercised during machining and processing to insure the safety of the flight crew as well as the aircraft. Material; 4340 Alloy Steel, Vacuum Arc Remelt. Heat Treat; 260,000 – 280,000 PSI Ultimate tensile strength, Rockwell C scale hardness 51-53. 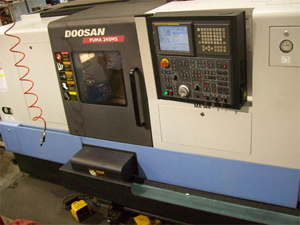 Process; We machine the part complete less the threads on our Hitachi Seiki CNC lathe and Haas CNC vertical machining center, Allowing grind stock on three diameters. From there, the parts are shipped to the customer for identification prior to heat treat. Next, the parts are Heat-treated, 100% hardness tested, Hot straightened to within .005” TIR between centers, and stress relieved. A Tensile test is performed to verify the material strength, as well as a lab test which checks for surface decarburization. 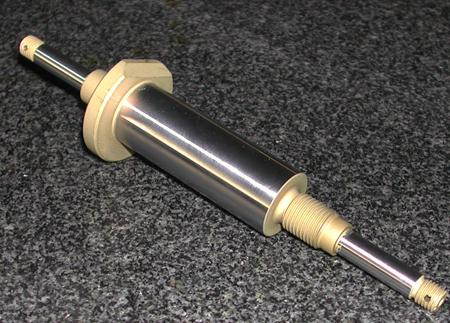 After receiving inspection, we grind the diameters to pre-plate size and send the parts out to one of our trusted vendors for thread grinding, allowing for Cadmium plating thickness when sizing the threads. Then its on to the Plating house, where the parts are Nital Etch inspected to assure that the grinding operations did not induce any surface cracking, followed by Stress relieve, Magnetic Particle inspection, Mask & Shot Peen and two cycles of Hard Chrome plating and Stress Relieve bake. Finally, the Hard-Chromed diameters are ready for finish grind, followed by mask and Low Hydrogen-Embrittlement Cadmium plating and a final Magnetic Particle Inspection.